When you're filthy rich or trying to become so, there comes a time you find yourself wanting the very best of whatever it is you want. If it is an exquisite ultra high-end audio-system you are after, you might want to take a look at Kharma. Kharma International is a luxury audio brand based in the Netherlands. 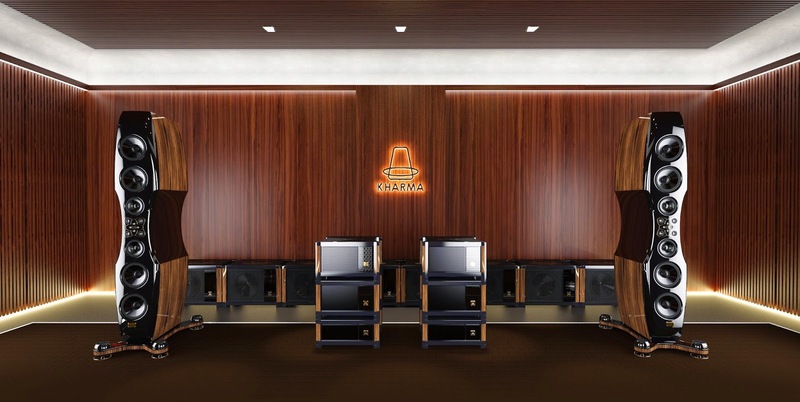 The Kharma brand was developed with in mind the ultimate goal of perfect true sound, but with aesthetics that match the luxury design environment of the clientele. Their recently announced 'Enigma Veyron' system will be the most advanced audio system in the world. To create extreme resolution and dispersion for the upper mid en lower high frequencies the main loudspeakers will be equipped with eight absolutely unique diamond drivers, constituting in the largest diamond surface cone ever build into a loudspeaker system. For the low midrange Kharma uses four 10-inch bass-midbass drivers and they've added four 7-inch midrange drivers for speed and dispersion. This new Kharma Enigma Veyron system has internal cabling with mono-atomic ultra pure silver and all crossover elements are in pure silver-gold-carbon. Complete freedom of resonance is achieved by using a newly-developed lossless connector system on a mono-atomic bases and a stand using ceramic balls. Kharma's Enigma Veyron system will be launched in 2015. No price has been released yet.